Many farm animals give birth to more than one offspring, though even among those that usually produce single births, such as cows and horses, some will occasionally produce twins or triplets. Even among those species that regularly produce multiples, some mothers may give birth to only one offspring at times. The number of offspring to expect will never be an exact science. The question of why some animals produce multiple offspring while others give birth to one at a time comes down to reproductive strategies. Many animals living in harsh or unstable environments produce multiple babies quickly and repeat the process as often as possible to ensure that at least a few of their offspring will survive to replace them. Those animals are referred to as r-strategists. 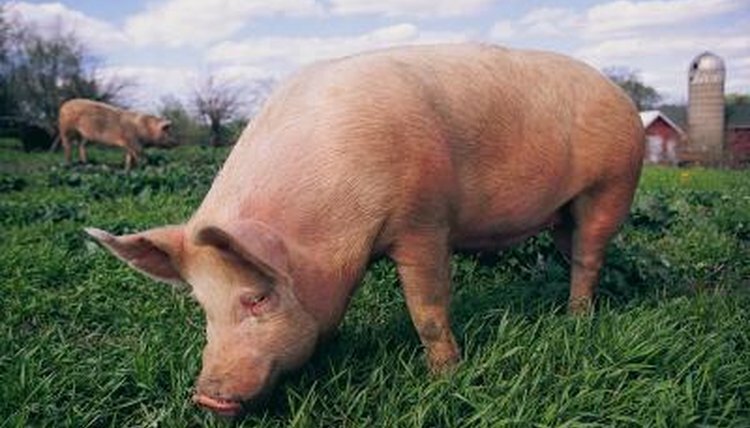 Animals living in controlled environments, such as farm animals, are called K-strategists. They have longer and fewer gestations. Their offspring require more attention for a longer period, so they tend to have fewer of them. Farm animals have been greatly manipulated by humans through controlled breeding and environments, therefore those animals' strategies can, and do, change -- often to the point that survivability in the wild is no longer possible. When humans domesticate a once wild animal like sheep, for example -- which produces single or twin offspring in the wild -- it may become economically important for ranchers to modify the sheep's reproductive output to produce more lambs for sale. To do that, breeders may choose to breed those sheep who tend toward multiple births over those who do not. Over time, birth outputs increase. Similarly, humans may manipulate estrous cycles to favor animals who have more pregnancies in a year over those who give birth once annually. Generally speaking, the smaller the animal, the more offspring it can produce. Leaving more exotic “farm” animals like rabbits off the list, the pig is, without a doubt, the most prolific of all farm mammals -- often producing as many as 20 piglets from one gestation -- a fact which may account for the number of “factory farms” that raise pigs -- while cows will typically give birth to only one calf. Sheep and goats produce 1 to 3 offspring per gestation on average and can produce two litters per year. Both species sometimes give birth to quadruplets and on rare occasions even more. Pygmy and Nigerian dwarf goats are especially likely to produce more than 3 kids per gestation. Poultry is a bit different in that humans not only control their breeding, but can directly control the number of offspring produced by artificially incubating their eggs. Therefore, selecting the chickens, ducks, turkeys or geese you want to raise depends more upon egg production than living offspring. If your goal is to raise poultry, look for top layers like Leghorn chickens -- an egg-layer extraordinaire -- or Khaki Campbell ducks, which, unlike most ducks, produces as many or more eggs per year as an average hen.